When mom leaves the house, turns the TV on to the cartoon channel and doesn't say goodbye something is fishy. That’s right….our babysitter is coming to take us for our walk. It means momma went out without us. But where did she go? The happiest place on earth….Disneyland. That mouse said if its your birthday, I'll let you in for free. We would never listen to a mouse, ever…but we have to say this is the only exception. Mom and Deb went on a crazy fast ride called Space Mountain. Deb wanted to throw up. I don't throw up but Lily does if she eats then runs 90 mph. Then to the Dumbo ride. We never knew elephants could fly. We will have to ask Max in Africa about that one. We imagined being there with mom. A few other adventures were a jungle safari, the Rockets, Thunder Mountain and a haunted house ride. We saw enough scary things to last us til next trick or treat day. We finally realized why we did not go along. Reason: They went on a silly ride where you sit in a tea cup and spin. Weird. We don't like to spin, we would have gotten sick. Walking around they came across Pooh and Tiger. I can't believe Pooh was there. We would have loved to have seen Pooh. They went on the Pirates of the Caribbean ride and Peter Pan. There was a doggy teasing the pirates.Wonder why he was allowed in Disneyland. Mr. Toads Wild Ride sounds icky..I don't think we like toads only frogs. Little Bo Peep? You never know who you will run into at the mouses house. Mom wanted to call the authorities when she saw this little humans hair. What was his mom thinking!!! Well friends...hope you enjoyed the humans happiest place on earth. No place run by mouses is happy to us. Humans are crazy sometimes. We're happy right here with each other. What a great day for your mom! Good thing you stayed home, though. Those tea cups! Barf-o-rama! Mom wants to go there so bad. But she hardly ever goes on a vacation! Next time your mom goes away, tell her to swing by our place and drop you off. We would love to have you! We're with you on this! 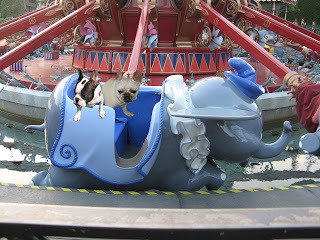 As much fun as the hoomans say those rides are... we don't want nuttin to do with a giant rat! We ain't gonna fall into his trap. No way. Not us! Sounds like your mom had a wonderful birthday!!! Hi, Say hi to your Mom and what a fun place! I would love to get to Disney again, I have not been there in a few years!! Happy Birthday to your Mom! My Mommy loves that place and thinks it is about the best place to spend a birthday ever. I think some of those rides would be scary so maybe its best you didn't go this time. Thanks for taking us on the journey though. Looks like your Mama had a fun birthday trip to Disneyland. My Mama used to go there when she was a little bitty girl. You know...the dark ages!! We just absolutely loved that post of course! The not-so-little man's most favourite place to visit - he is already on countdown to our next trip to Disneyland Paris in March. Only four months away though - and we know exactly as he's counting down the days several times every day. Pirates of the Caribbean and Thunder Mountain are his favourites and Splash Mountain last year in WDW in Florida - he so wishes they had a Splash Mountain in Paris. Anyway, thank you so much for sharing those fab photos - they have only added to his mounting excitment. Oh! Happy birthday to your mom! And no wonder they don't take dogs there with gigant stuffies walking around - they would all be decapitated in no time (like Mango says - two stuffies for the price of one.. tee hee..). What a fun time your mom had! We're not sure about that teacup ride though! Spinning around and around and around in a circle - ugh! Glad you 'n Lil are happy tuhgether.